This is of course Thanksgiving week for Americans. Always a nice time to get together, share a meal or two and in my house...make tags. Each year, while the men watch football, the rest of us make tags for Christmas packages and neighbor gifts. For obvious reasons, my house is always a good one to host this kind of party since I have all the supplies one would need. We keep it simple with inks and rubber stamps. Although this year I introduced a few die cuts to the group...gotta love the antlers! I photographed a few of the tags we made in case you wanted to have your own Tag party. New stamps mixed with old, Distress and Archival ink, finished off with Trimmings...all good things for making great simple tags. On another note, since a lot of Tims stamps come in small versions, we found that you could make a very similar tag using a #5 size (instead of the #8) which are great for smaller packages, jar labels, or on gift bags. This is the one picture I took that night of my best friend's daughters that were home for the holiday. Becca tried Distress Markers for the first time and fell in love. 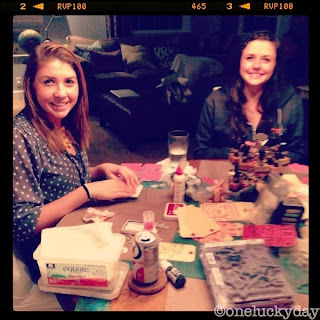 Rachel went the more traditional route and stuck with stamping. Either way we all had a great time and we now have finished tags for wrapping presents. Love your tags! We no longer exchange gifts, but I sure do love looking at tags. 'It's beginning to look a lot like Christmas'.......wonderful tags! Looks like a lot a fun was had by all! Love the tags!! Oh that sounds like fun! Love the deco tag with the Sap Green ink. And those antlers just make me smile. Thanks for sharing. Paula - what a wonderful tradition! I would tag with you if we lived closer! Happy Holiday preparation time! The tags are wonderful!! It's my birthday and I just spent a small fortune on TH dies and stamps online and after seeing these I most definetly need the antlers! Love it! I am going to order the sap green! What a fun idea, a tag party....I LOVE IT!!. This is such a good idea! A couple of friends would like to try stamping and what a nice simple way to get started while letting them be creative in their own way! Love your tags, especially the green trees tag. Thanks for the inspiration.